The Cavalcade of Wings model display stands ready to greet vistors in "Great Hall" on Level 2 of the Albuquerque International Sunport. For more information and directions please visit our FAQs page here. 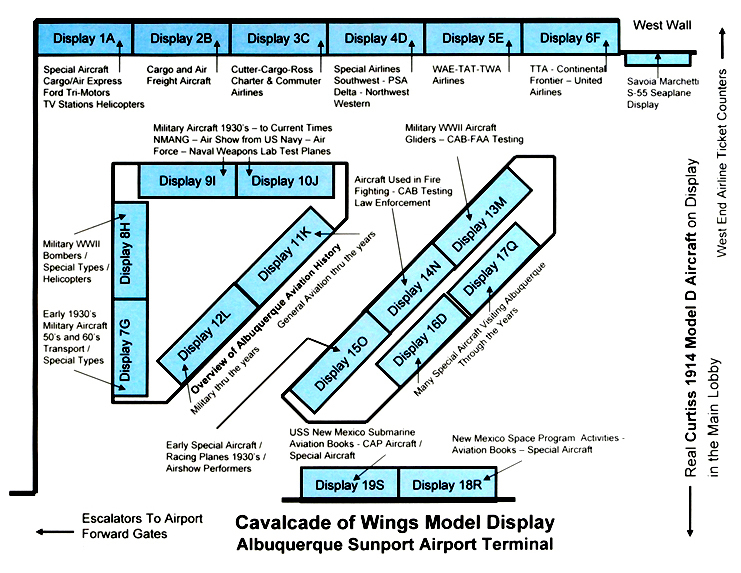 A map to the display cases at the Cavalcade of Wings. Visit the Display page here for more information. Visit the west wall of the Cavalcade exhibit and experience the many airlines that have made Albuquerque their home. Military Aircraft from the 1930's through WWII grace these Cavalcade displays. Visit the aircraft that have made Albuquerque a stop along their journeys. Visit the Savoia Marchetti S-55 Seaplane Display.